This hotel offers unparalleled luxury on the beautiful island of Saint Lucia. Guests will be greeted with breathtaking views of the Caribbean Sea from all angles, as well as capital city Castries to the South and nearby Martinique to the North. All of the stunning accommodations are equipped with their own private porch or balcony, giving guests ample opportunity to soak up the natural beauty found of the island. Guests looking to explore the area will have countless opportunities to experience local culture from Castries, which occupies the crater of an extinct volcano, to Pigeon Island National Historic Park. 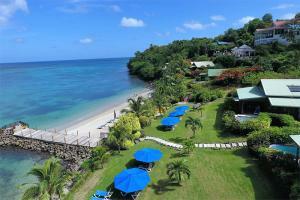 Located in the north part of the beautiful island of Saint Lucia, nestled in a secluded and peaceful cove.